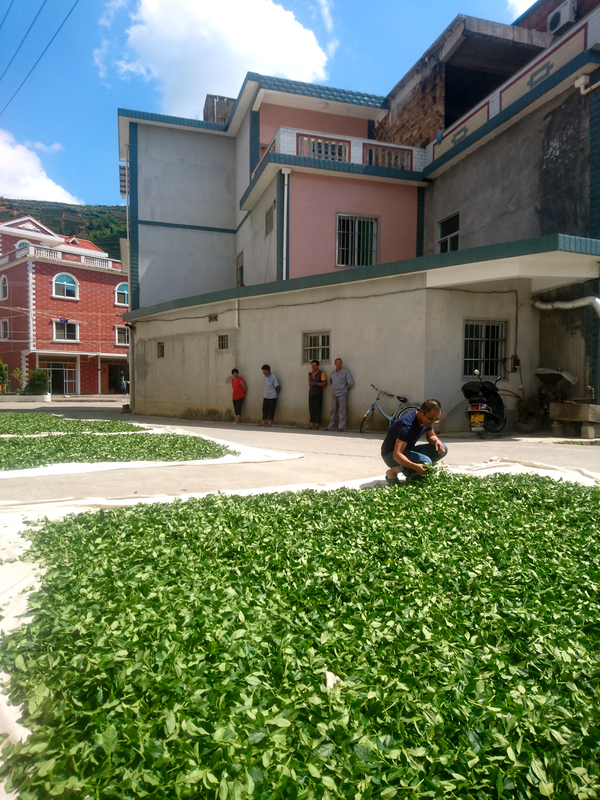 Between September and October, I have been able to follow step by step the Tie Guanyin production in a Juyuan tea factory, Anxi County, Fujian. As usual here you will not find legends or farmers stories, sick ladies and princesses, those kind of things you can esily find everywhere, on various blogs. I will simply try to analyze, in a clear and impartial way, the production of one of the most famous and sold chinese tea in the world. And there will not be so much poetry. Guan Yin tea is a wulong tea, produced in the Anxi County of Fujian. It is one of the bestselling and appreciated tea in the world. At the moment, after a strong commercial growth, there is a market crisis. Starting from the assumption that China domestic market is vast in terms of population and customers, the best quality tea is all for domestic use and sale. Consequently in Europe, and abroad in general, there are tea batches of inferior (or even poor) quality . To be sincere, all the time I was in Juyuan (and then at the source) I did not find Tie Guanyin that costed less than 200 rmb (about 25 euros) for jin (half a kilo): some European importers are able to sell it even at 30/40 euros per kilo. Obviously I found much tea of very high quality, with very exorbitant costs (1200/1500 euros for jin, half a kilo). Why this difference in cost? As already said, Anxi County, Fujian, South-East China. The production area is protected by mountains both south and north. The contrast between the southern humid winds and the northern dry winds make this territory unique by geographic, climatic and biological characteristics. The average temperature is 25 ° C, in a year there is about 140mm of rain, with peaks between August and September of about 400mm. This data relates to the whole county, for the period from July 2016 to June 2017. Actually, hill and mountain are slightly different: the average temperature is 19 °C, and there are about 190mm of rain. 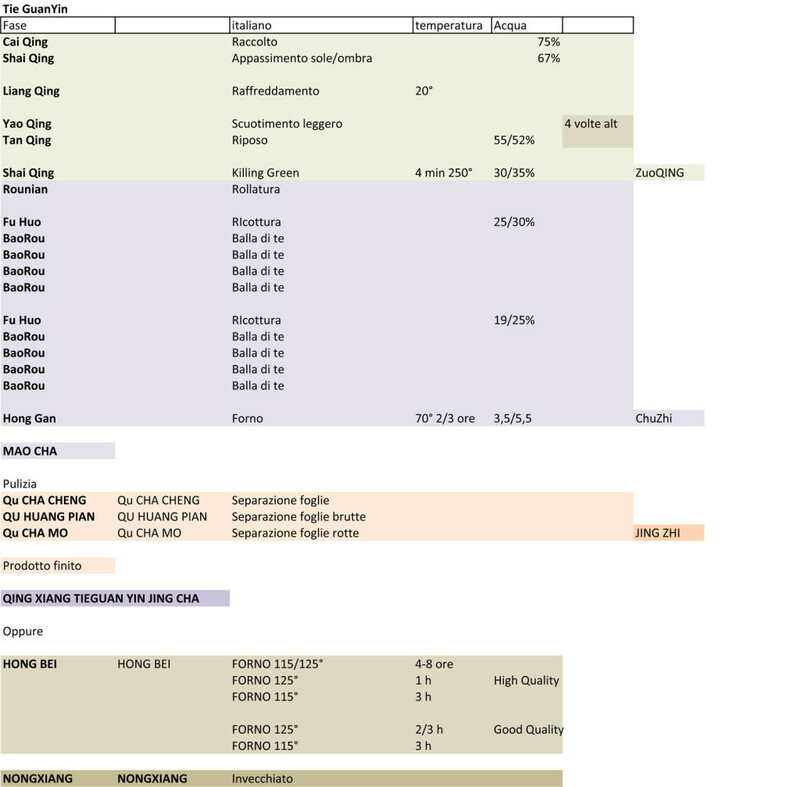 Clayish, of course, acid PH between 4.5 / 5.5, organic matter between 2.5/3%. 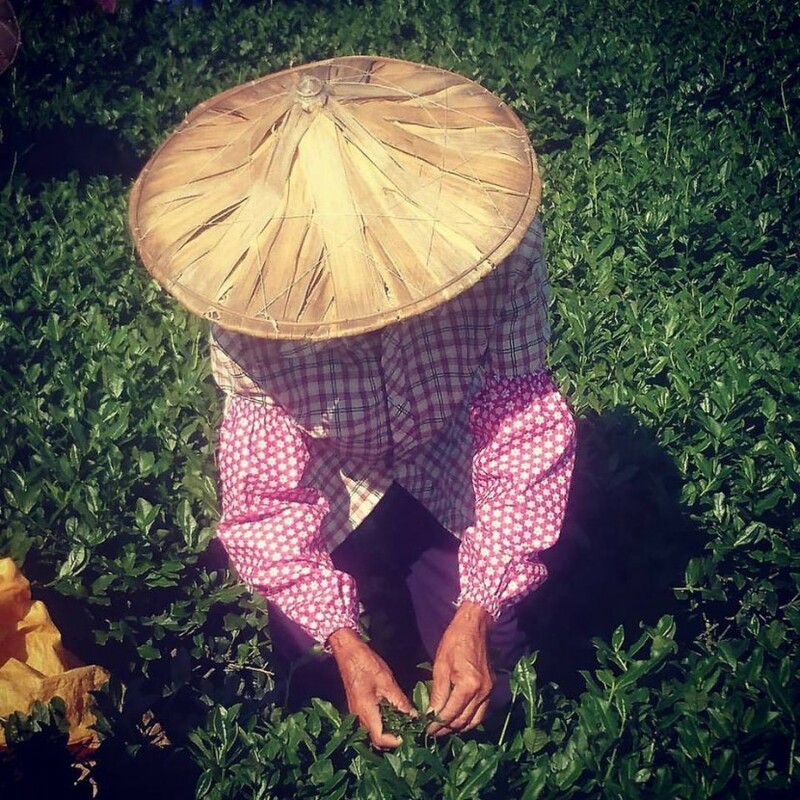 Guan Yin tea is a typical geographic product and production is regulated by precise standards. L’argilla è un elemento fondamentale e caratterizzante nella coltivazione del tè. These are the phases. Of course there is an order, but some phases can be repeated. At the end, you will find a summary. Personally, I love the harvest. It is a mystical, ancestral thing. Lost in time. The time of harvest is not established, it depends on so many factors. First, the plant has to be ready. The climate must be right, and so temperature and time. Harvests are divided for time slots, usually from 9am to 4/5pm. Of course, a tea harvested at 10am o’clock will be quite different from a tea harvested at 4pm o’clock. The leaves used to produce the most fine Tie Guanyin are those harvested between 11am and 2pm, at the hottest time of the day, when the leaves are full of their vigor and better resist the next stages of working. 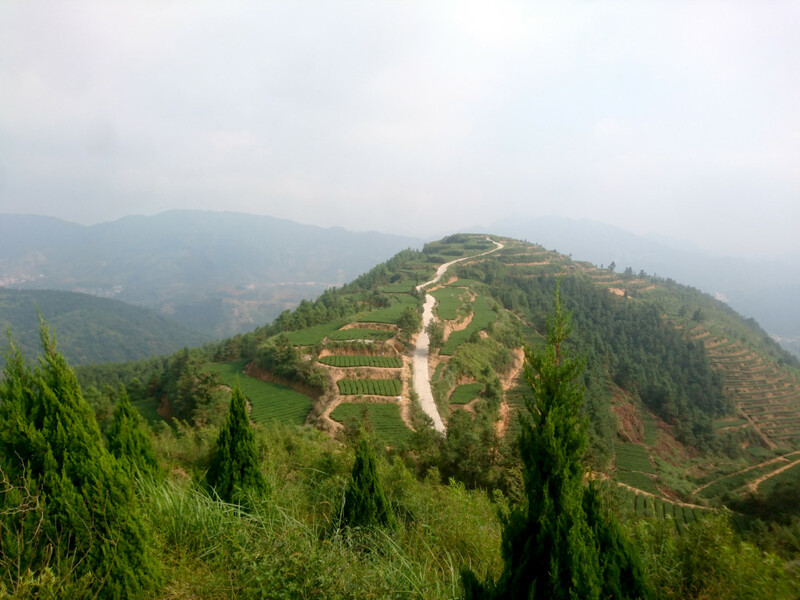 On the mountain of Juyuan, the harvest is totally made by hand. The leaves are put in big bags of 50 jin (25 kilos) and immediately brought to the factory. Speed and control are essential to having a good quality tea. The leaves arrive at the factory. From now on speed, control and above all the decisions of tea master are of fundamental importance. The bags full of tea leaves are weighed and organized with the indication of the harvest time and of the mountain area. Withering occurs first in the sun and then indoor. The leaves are rotated and mixed several times to make sure that heating is homogeneous. This phase “dries” the leaves: the water percentage drops to 67%. The tea master enthusiastically comes into play: from now on, he is the commander. It becomes a matter of attention, control and speed. After Shai Qing, the hot and sunny leaves are spread on bamboo trays in cooled rooms for about an hour at 20 °C. Yao Qing is one of the key stages in wulong production. The leaves are shaken, lightly moved, in bamboo baskets or in special machines: in this way, in addition to slightly breaking the edges of them, the water present in the stem and in the center of the leaf tends to spread over the entire surface of it. Leaves are left to rest. In this way, they tend to elasticize and soften. Water is stimulated to decrease. Now, the water percentage is about 55/58%. 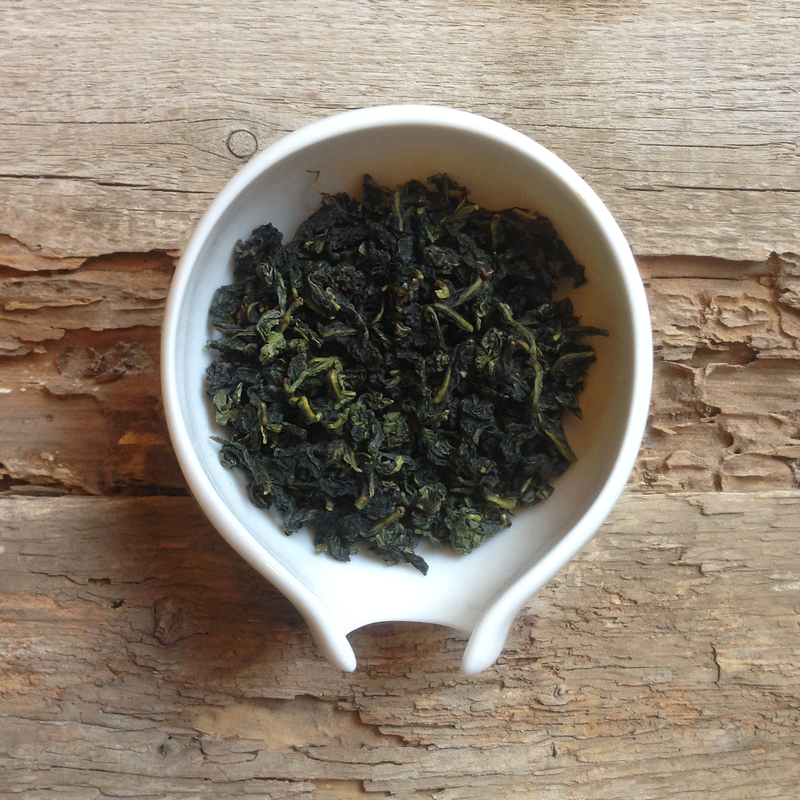 These first phases are called ZUOQING, an expression that means “to make/cook the raw leaf”. I love. Like John Barleycorn. You have to kill to preserve. You have to kill to have. Both manual and mechanical, this phase consists in “baking” the leaves to block and inhibit the enzymatic oxidation process. With a machine, at 250/260°C for a maximum of 5 minutes. Water percentage collaps by 18/20%: we are at 35%! The leaves, still warm, are worked in a machine, but also by hand: they must be crushed and twisted. In this way you can extract the juices and oils from the leaf that, in a sense, are bound to the leaf itself. Subsequently, the leaves are inserted into a rotating cylinder to be separated/divided. The leaves are baked again for a very short time. They still lose water, we are now around 20%. The leaves are wrapped in a sheet and spherically closed. A spinning machine compresses, crushes and twists them. The rubbing between leaves begins to give theTie Guanyin the classic rolled shape. This stage must, or can be, repeated several times. At least twice. In this factory, it works like this: Fu Huo > Baorou > Baorou > Baorou > Baorou > Fu Huo > Baorou > Baorou > Baorou > Baorou. Leaves are baked for about 2 hours and half at 70 °C. This second phase, from Sha Qing to Hong Gan is called ChuZhi, first phase. Now we can call the finished product MAOCHA. The tea is almost ready, it must be only cleaned: you must make the product saleable. This phase is called JingZhi, that is “doing things properly”. We have our Tie Guanyin, ready to be drunk. Its name will be: QingXiang Tie Guan Yin. QingXiang means Delicate Fragrance. 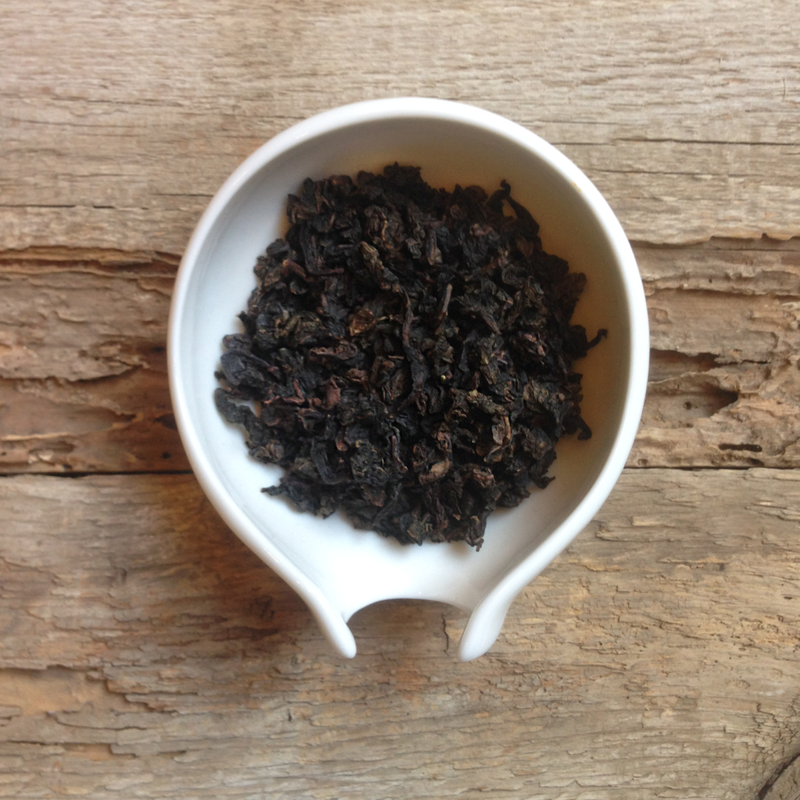 We can take our MaoCha and bake it again for about 4/8 hours at 115/125 ° C.
In this way we will have a smoother, less floral, toasted flavor. A very sophisticated tea that is quite unknown in the West. Obviously, according to methods and times of “baking” we can have different qualities. This tea, this HongBei, may also be suitable for aging: in this case we will call it NongXiang Tie Guanyin. Nong Xiang is practically the opposite of QingXiang, Strong Fragrance. 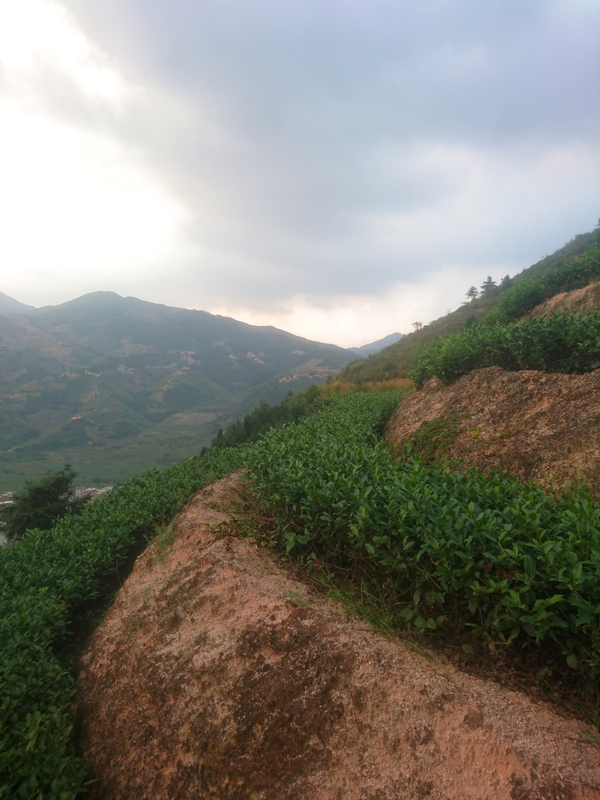 From the moment the tea is harvested, until the end of QingXiang Tie Guanyin production, there are no more than 18 hours. 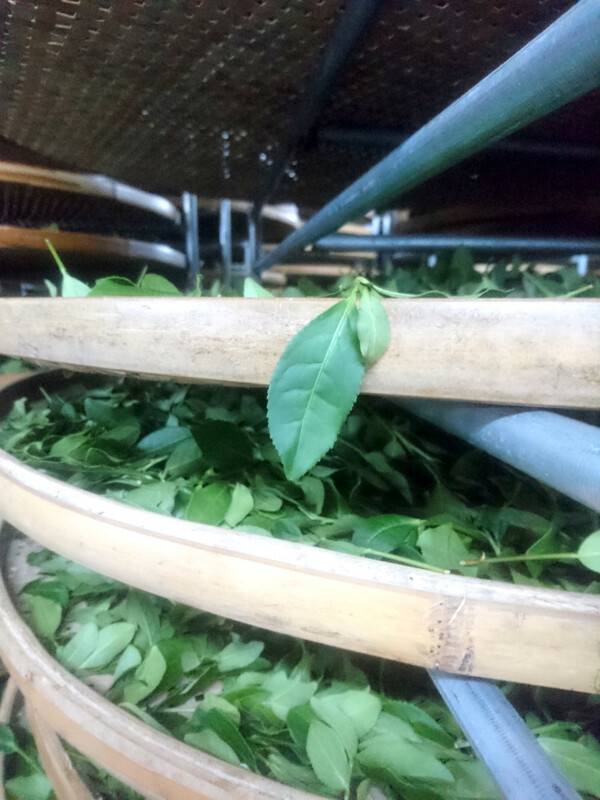 Leaves that arrive in the afternoon are also processed at night. To have 500 kilos of finished product you need about 2000/2200 kilos of fresh leaves.